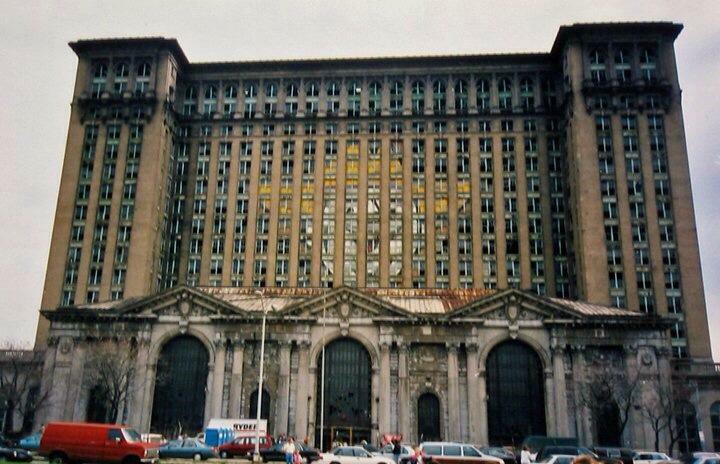 I’ve been thinking about Detroit a lot recently and remembering all of the energy we had for doing things there. 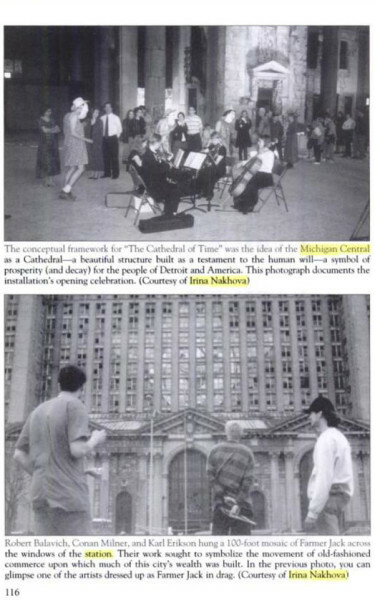 One of the funnest was an installation (part of a large group project unfortunately titled “The Cathedral of Time“) at the Michigan Central Depot in association with a class at Wayne State University taught by Irina Nakhova. 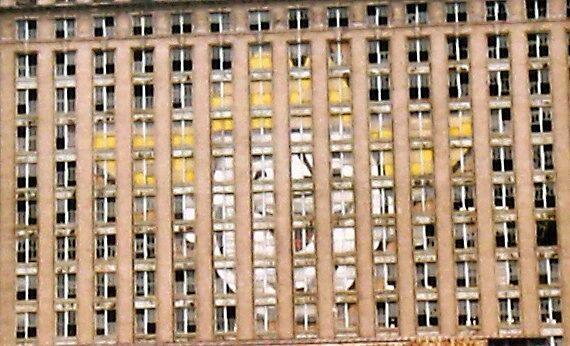 My collaborators, Conan Milner and Robert Balavitch, and I created a giant 8 story high portrait of Farmer Jack for the windows for the beautiful abandoned train station. Then we donned dresses and over-sized Farmer Jack masks and danced around. Farmer Jack was the mascot for the grocery store chain of the same name. We thought of this as a tongue-in-cheek celebration of new of the very few businesses that was actually opening stores in Detroit at the time. The dresses and masks were meant to address issues of food production, preparation and consumption along side gender roles. I am unclear how well the project was received, though I quite enjoyed it. From my perspective, it was very much influenced by Mike Kelley’s “Meditation on a Can of Vernors” and the critical, satirical investigation into the influence local popular culture on the individual psyche. Thanks to Robert Balavitch for providing the images.